ASTM A 182 Stainless Steel Forged Threaded Full Coupling, ASME / ANSI B 16.11 Duplex Steel Screwed Full Coupling Supplier & Exporter. SS Threaded Full Coupling, Carbon Steel Forged Screwed Full Coupling, Alloy Steel Threaded Full Coupling Manufacturer. There are several types and forms of couplings available but one of the most demanding and popular ones is Forged Screwed-Threaded Full Coupling. These couplings are widely used in numerous industries and applications due to their exceptional features and mechanical properties. These couplings are basically devices that are used for connecting two shafts together from the ends for transmitting power. Normally couplings do not allow operation but there is a torque limit which can disconnect the shafts. The primary focus of these couplings is to join two pieces of the rotating equipment and permitting a small degree of misalignment. These threaded and screwed full couplings are available in different shapes and sizes as per the requirement of customers. The leading and reputed manufacturers available worldwide are offering their customers a high quality of couplings at a competitive price. They manufacture these Forged Screwed-Threaded Full Couplings using high and superior quality of raw material that is tested and inspected by quality experts. The material is used as per the international quality standards. The material is mainly tested to ensure that the material will provide its best service under different temperature and will help in making a high-quality product. In addition to the raw material, manufacturers even make use of the latest technology, machinery, and tools for making accurate shape and size. They even make sure that the product should consist of national and global specifications and standards. The customers are offered the high-quality product as per the demand and requirement of customers. Once all the manufacturing process is done this Forged Screwed-Threaded Full Coupling are sent for the testing process. The tests are done as per the set industrial rules and regulations. The tests include third-party inspection, flaring test, ultrasonic test, flattening test, visual inspection, pitting resistance test. There are some more tests done like positive material identification test, destructive test, non-destructive test, chemical composition analysis and more. All these tests are done under different temperatures and pressures to ensure products capability and performance. In the end, Forged Screwed-Threaded Full Coupling is packed in high and waterproof quality of packaging material in order to avoid rust and unconditional damages until the last stage of production. Surya Steel & Alloys is a known manufacturer of Forged Screwed / Threaded Full Coupling, which is widely used in many fields, especially marine and chemical processing. We offer a spectrum of Forged Screwed Full Coupling, which are reckoned for its durability and resistance against corrosion. Forged Threaded Full Coupling is quality tested under the supervision of professionals who have adequate credentials to engage in this field. Stainless Steel Forged Screwed Full Coupling is known for its High quality, Precise dimension, Easy installation, Seamless finish, Non-corrosive properties, High tensile strength, Sturdy construction, High performance, Longer life, Seamless finish, Chemical resistance, and more. Stainless Steel Forged Threaded Full Coupling is of optimum quality and is used by many people for various backgrounds dealing with this business. We are an integrated entity engaged in the procurement of top rated Carbon Steel Forged Screwed Full Coupling across the value chain, which are highly recognized for its superior strength and stability, robust construction and higher machining ability performance. Further, Carbon Steel Forged Threaded Full Coupling is known for giving the authentic performance for a longer time. Our team of marketing and procurement experts strives hard to source and supply only Alloy Steel Forged Screwed Full Coupling which is based on latest technology of the present time. Developed using supreme quality raw material, Alloy Steel Forged Threaded Full Coupling is known for their durability, resistance against corrosion, fine finishing and anti-abrasive nature. 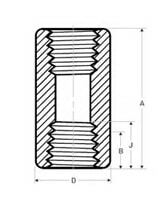 Alloy Steel Screwed-Threaded Full Coupling : ASTM / ASME A 182 GR F 5, F 9, F 11, F 12, F 22, F 91.